Get the new version of Logic – it’s definitely worth the relatively inexpensive $259NZD ($200USD) for bug-fixes alone, and more so with all the cool new added features. Keep your old Logic version just in case you still need those 32-bit plugins. 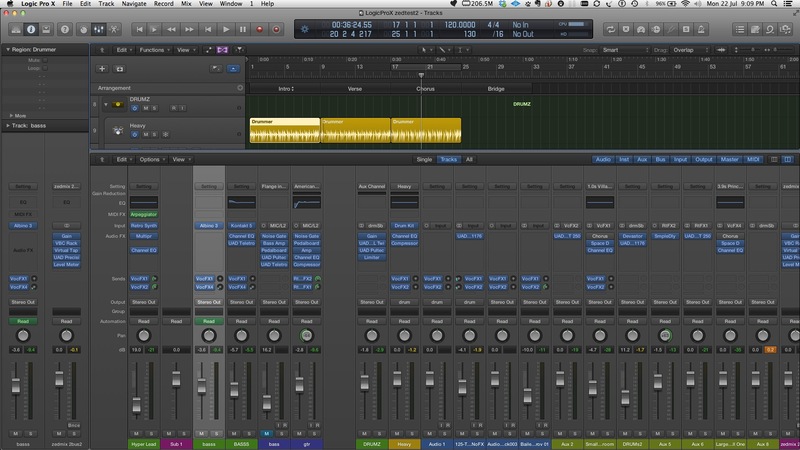 It looks slightly GarageBand-ish, but without the woodgrain skeuomorphisms. Maybe it’s more like the other Apple Pro Apps – very dark background, almost neon coloring for media and highlights. Very high contrast. Some people will hate it, but I use so many DAWs and have been mentally preparing for any changes to the Logic 9 “look” for so long that I really don’t mind. 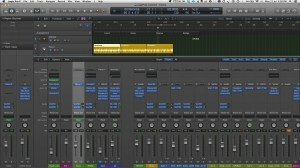 I still think it looks better than Ableton Live. The overall layout appears much cleaner, with more space for the Main Window (no longer called the Arrange window). Apple removed the transport bar at the bottom and included all the menus and transport controls at the top of the main window, with an extra row of customizable tools revealed with a button. The various editor and media tabs are in their usual places. The Library is now on the left and includes a few more visual features (eg patches for Drummer). Nothing really essential has been cut out as far as I can tell – just moved or upgraded. A couple of seldom-used items in the sample editor have gone – Audio to Score for example, and the murky Averb now seems to be absent (it still shows up in pre-X projects). (Edit: Behaviour of SOLO is different – you can’t solo individual virtual tracks going to one instrument. This used to be a preference option that is now missing. A bit of an annoyance and less “Pro”). All menus/functions still appear to be included, but they have been re-sorted under menus that are a bit more workflow-oriented. They actually make more sense this way and are pretty intuitive. An improvement. Flex Pitch mode operates just like Celemony Melodyne – you can adjust the pitching of sung notes, adjust vibrato, shift the formant, tilt etc. You can also adjust timing and length of notes. It’s pretty easy to use and is fairly transparent. The new Drummer gives us some cool-sounding sampled drum kits and associated grooves that can be tweaked to give degrees of human feel with nuances, fills etc. Somewhere between an instrument and a track (you choose it as one of your New Track options), it shows up on the track as a sort of “virtual waveform” that reflects the content of the beat you select, and that can then be control-clicked to show editable MIDI regions instead. You can manually use just the drum sounds by selecting Drum Kit Designer from the instrument menu. I can see a lot of songwriters using Drummer. This is pretty cool. There are two stack modes for this powerful new function. The first mode – Folder Stack – is essentially a new way of bundling tracks into a folder. This is a much more graceful method of managing groups of tracks than the old add-to-folder method, as it has a master track that can easily mute or solo all the included tracks. And you can hide or reveal all the included tracks with a single click on a disclosure triangle. Folders are still included in Logic, but are now hidden away under a branched menu. I guess they want to phase them out and use this new way of doing things. The second mode – Summing Stack – is an easy way to assign a bunch of tracks to an Aux bus – eg drums. This is the most powerful mode of the two, as you can also create Summing Stack presets, and you can do some cool things with multi-output software instruments – eg multi-output drums. This will be a useful way for people to manage their instrument and vocal groups. I use summing groups all the time, but this new stack mode makes it pretty much idiot proof – just select a bunch of tracks – right click and “Create Track Stack”. The only annoyance is it uses the next available numbered bus, and I have all my buses pre-named for mixing purposes – eg vocal effects, rhythm effects, drum/bass/guitar/voc bus etc. Just a niggle. Yes, finally you can insert an Arpeggiator into a MIDI channel strip directly, without having to brave the scary Environment window. These MIDI plugins affect what is played live or played back from the recorded track. Pity you can’t also record this data onto the MIDI track itself – it would be even more useful. There is a bunch of MIDI plugins you can insert – chord memorizer, modulator (yay – modulate MIDI parameters in time with your song! ), scripter (yes you nerds out there can write your own scripts to affect the MIDI data coming off the recorded track) and a few more. They show up as green plugin slots in the channel strip. This was one of the cool things that GarageBand had that Logic strangely didn’t (you had to use the Marquee strip instead). You can now label song sections on the new Arrangement Global Track and then just move the sections around to easily rearrange your song. A new panel that allows you to adjust “macro” knobs to control plug-in and instrument parameters on a channel. They can be customised, automated and also controlled via hardware. A bit like the macro knobs in NI Massive, or the control panels you build and map in MainStage. The old Sample editor has been replaced by a panel that switches between two modes – either close-up non-destructive editing of an audio track (eg Flex Pitch or Flex Time operations), or destructive editing of audio files (okay here it’s just the Sample editor with a different name). Almost the same as it was before but with a couple of cool new features. You can now quantise selected MIDI notes to a key or scale, and adjust the overall MIDI velocity for the region with a slider. This new instrument plugin is pretty cool. It sounds good and has four different synth types on different edit tabs – analog, sync, wavetable & FM. Some new flavours, or perhaps just a one-stop-shop of some of Logic’s existing synth plugins? I’m not sure as yet. Like Ableton’s help system – it shows handy tips for whatever you’re pointing your mouse at. Saving into project folder or into a project “bundle”. You now have a choice of whether you want to save each song as either a regular old folder-based project, or into a single-file bundle (like GarageBand projects). Not sure of the advantages/disadvantages of each yet, but it’s simpler to backup or copy or move one file than a whole folder. You can choose a track to be the master Groove Track for the song, and then have other tracks follow this, rather than be individually quantised. (You can’t do both). This looks good. Previously you had to create a groove template and then select that same groove template as a quantize option on the other tracks. This was easy if the source was MIDI, but if it was audio you had to convert the audio to MIDI first. Finicky. Now it just does it with either MIDI or audio tracks with the click of an icon. Zoom appears to work much better – including in the audio editor – with more accurate centring/playhead tracking, and with more waveform detail (including waveform zoom). Scrolling along the timeline is also much improved – especially when scrolling outside the Main window. It used to take off in a frustratingly jerky way that managed to annoy every Logic user ever. Now it remains smooth and consistent. Logic’s B3 Organ, the Clav and the Electric Piano instruments have all had a face-lift and been re-branded as Vintage B3, Vintage Clav and Vintage Electric Piano, with some additional controls. Not essential, but nice. Hitting Solo doesn’t light up the bar ruler in yellow as it did before – it now darkens every region not solo’ed and the transport meters now display as yellow. A bit more obvious that you’re in Solo mode now, I hope, since it’s one of the things that catches everybody out at some point. Logic no longer tediously scans every AU plug-in in your system every time you run it. I can’t say how awesome this is. Thanks Apple – about time! Can I have back the several hundred hours of sitting through the old startup process please? Logic takes regular snapshots while you work and saves it into the project file. You can revert to any of these. You can also save different versions (“alternatives”) of the song into the main file. I save every 10 seconds anyway, but others might find it useful. Channel Strip components more closely reflect the order of signal flow. This is a move against typical convention, which mirrors physical analogue console design, where more regularly used items are generally closer to the engineer. Re-ordering the components is a really good move that makes more sense in the digital world- especially for users who are coming into Logic without ever using real mixing desks. Channel strips are laid out top-down – with input at the top (actually just below the EQ and gain reduction displays), then effects plugins, then sends, then outputs. The pan is still in the wrong place above the fader, and post-fade sends still sit above the fader, but it’s a lot better than it was. Because green now indicates MIDI plugins, any pre-fade sends, instead of showing as green, just swap the position of knob and aux send selector slot (knob is to the left instead of the right) so you can still tell one from the other. I thought the colour coding was a bit easier to distinguish. MIDI channel strips place the MIDI plugin effect before (above) the instrument (input) slot, which is logical, since it’s processing the MIDI in between the input (or recorded track) and the virtual instrument plugin. Plugins that are placed in slots are now easier to move, copy and bypass. You don’t need to switch to the grabber tool to move plugins. Each occupied plugin slot has three zones: a little on/off switch (to bypass the plugin) on the left, a place in the middle to open up the plugin GUI, and on the right is the “plugin select” menu. New Guitar and Bass tracks and amps – you can create new audio tracks that are already set up for monitoring guitar or bass through Logic’s virtual amp plugins. This makes it faster to get sounds happening in the studio while you’re being creative. These amps are a bit of an improvement on the earlier offerings. Also – there are a couple more tasty “vintage” guitar pedals for the Pedalboard plug-in. Sometimes it’s the simple things. If you create a new guitar or bass track, you can open up a revamped Tuner using an icon on the top toolbar. It’s so much better than the old tuner, and can even be assigned to a key command. Love it. Finally you can select and move multiple tracks at the same time in the Main window. Another long-term annoyance finally defeated. Show Master Track quickly and easily inserts the Master Track into the main window. Handy for quickly doing automation for those outro fades. Mini Volume and pan controls on track header – means you can hide the mixer and inspector panel faders to get the biggest Main window possible, and still quickly tweak track volume/pan if needed. Gain reduction meter on each channel strip. So you can see the compressor working on each channel. It only works for Logic’s compressor, of course. Actually there’s not too much wrong with this release – Apple have obviously spent a decent amount of time beta-testing. There’s some minor bugs – sometimes when you click a plugin GUI, it also selects something in the background in Logic as well. A couple of crashes here and there – no more than usual. For an initial release it’s pretty stable. There’s a few things missing that I was really hoping would be included – like a revamped EXS24 Sampler and editor. For me, the dropping of the 32-bit plugin wrapper is a bit of a mixed blessing – it’s an annoyance until manufacturers upgrade all their plugins to 64-bit, but it was always pretty clunky anyway. Since Pro Tools 11 is driving the 64-bit AAX format update, I’m hoping the 64-bit AU plugins will also be developed at the same time. But I’m keeping my Logic 9 installed just in case.